April 4, 2018 - We heard from First Mate Services. George has had some health challenges and Rae Lee is 'a work awaiting progress'. November 22, 2016 Stu Polhamus advised he has sold Rae Lee to George Prosser at 1st Mate Yacht Services in Annapolis, Maryland. George did the refurbishment of Stu's other Dolphin Equinox, Yankee #237. We'll stand by for George to check in and when we get some news on her 'restoration', we'll set up a new page for #228. This is the history we have on Rae Lee up to this point. Please take down my "wanted - Dolphin" and replace with "purchased hull #228 Rae Lee" from Lance Werner. Stay tuned for updates & photos. Postscript: Boat will be kept at Rappahannock River Yacht Club on Carter's Creek off the Rappahannock River. Stu first contacted us in April to advise he was looking for a Dolphin 24 and we posted a Wanted notice on the For Sale/Wanted page. He is the former owner of Pacific Dolphin #271. 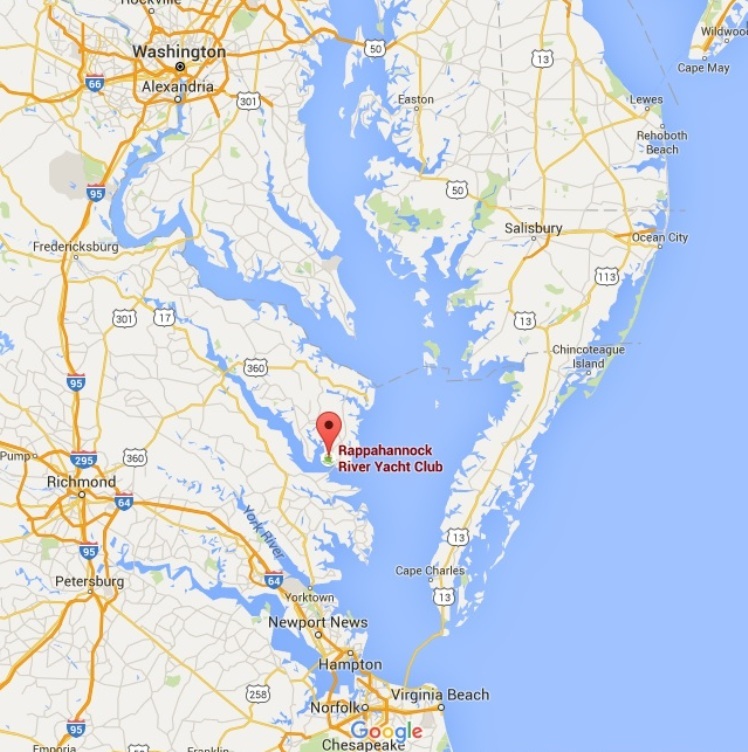 In keeping with current webmaster efforts to help Dolphin owners know the cruising areas of other owners here's a Google Earth view of the Chesapeake Bay area and the Rappahannock River YC. September 23, 2016. We failed to mention that Stu is 'hooked' on Dolphins -he bought Equinox, Yankee #237. Click here to go there. And this is the history we had on #228 up until this point. May 2, 2016 - Lance Werner reported he sold Rae Lee a week ago. He also advises that she will still be sailing on Chesapeake Bay. We'll stand by for the new owner to check in. October 22, 2015. Senior DFI Mike Friel (Makarios, Yankee #241) brought this Craigslist ad to our attention. 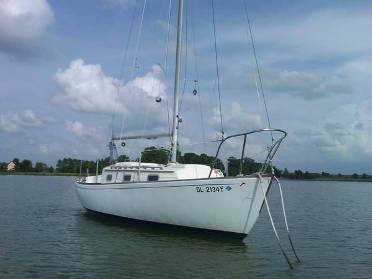 Sails, canvas bimini, 8 hp Yamaha outboard, port a head, and MORE! 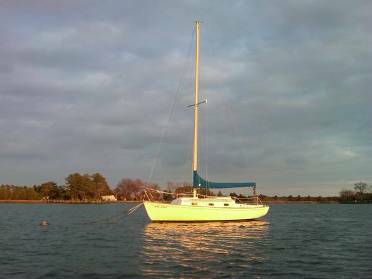 Great sailboat, 3 1/2 foot draft with centerboard up. Trailer excellent shape, new 2005...paid 4,000 for that alone! Hate to sell her! August 9, 2007. Lance checked in with these photos of Rae Lee resting in the garden while she gets her bottom painted. He has had her since 2003 and keeps her in Oxford on Maryland's eastern shore. Her prior owner was Ralph Nichols, (Cap't Buzz Nichols - Wind Dancer II).